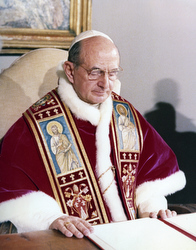 This is a translation of the speech delivered Nov. 21 by Pope Paul VI at the closing session of the ecumenical council’s third session. After two months of intense brotherly effort, we render thanks to God for the happy celebration of this Second Vatican Ecumenical Council, of which we conclude today the third session with this solemn and sacred assembly. Truly indeed, we must offer God the expression of our grateful and rejoicing souls for having granted us the great fortune of being present and, what is more, the fortune of ourselves giving consistency, meaning and fullness to this historic and providential event as humble and happy protagonists. Truly we may regard as spoken for us today the words of the Gospel: “Blessed are the eyes that see what you see and the ears that hear what you hear” [Matt. 13, 16]. Here is present before us, in the persons of its shepherds followed by their respective flocks, the Holy Church of God, called together by Him through our voice. Here is the Catholic hierarchy on whom it is incumbent to form and guide the holy People of God, gathered together in one place, in one sentiment, with one prayer, one faith, one charity on their lips and in their hearts. We shall never tire of admiring, nor shall we ever forget this incomparable assembly entirely intent on proclaiming the glory of the Father, the Son and the Holy Spirit, concerned only with re-evoking the blessed words of revelation and penetrating into their true and deep sense. This is an assembly of men free like none other from self-interest and engaged in giving witness to divine truths; men as we are, weak and fallible, but convinced of being able to pronounce truths that admit neither contradiction nor termination; men who are sons of our own times and our own earth, yet above time and above earth in order to take upon our shoulders the burdens of our brothers and to lead them to spiritual salvation. This we do with a love greater than these same hearts that house it, with a strained effort that might seem foolhardy, but is full of serene trust in its search for the meaning of human life and history to give it value, greatness, beauty, union in Christ, only in Christ Our Lord! Brethren, the fact that you are here is stupendous. It is stupendous for those who behold us from the outside. Never shall we behold a scene more impressive, more pious, more dramatic or more solemn. Our happiness increases as, in this final moment of the council session we are about to close, we recall the things that have been discussed, the things finally approved. The doctrine on the Church has been described and studied, and thus the doctrinal task of the First Vatican Ecumenical Council has been completed. The mystery of the Church was explored, and the divine plan of its fundamental constitution was outlined. Once again we thank God for this happy result and we allow our souls to be filled with legitimate bliss. From now on we can enjoy greater understanding of divine thought relative to the Mystical Body of Christ, and from this we can draw clearer and safer rules for the life of the Church, greater energy for her incessant effort to lead men to salvation, further hope for the progress of the reign of Christ in the world. Let us bless the Lord. Too much would need to be said on the work accomplished. Deserving of special mention are the reverent and exacting studies to make this doctrine conform perfectly with Biblical truth and the genuine tradition of the Church; the efforts made to discover the innermost significance and substantial truth of the constitutional law of the Church herself, to determine what is immobile and certain therein and what is a derivation by a process of natural and authoritative evolution from basic principles. The purpose of this has been to provide a fair treatment of every part, every function and every aim of the Mystical Body. It remains true that the most difficult and most memorable part of these spiritual efforts revolved around the doctrine on the episcopate. And on this point alone we should like to dwell briefly. We shall say only that we are satisfied that this doctrine has been enacted with sufficient breadth of study and discussion and with similar clarity of conclusion. It was a duty to do this, being a completion of the First Vatican Ecumenical Council. It was the time to do it because of the advance of theological studies in modern times; because of the spread of the Church throughout the world; because of the problems encountered by ecclesiastical government in the daily life of the Church, and because of the expectations of many bishops who were anxiously awaiting a clarification of the Church’s doctrine pertaining to them. That was also the way to handle the question. Thus we do not hesitate — bearing in mind the explanations furnished both on the interpretation to be given the terms used, as well as the theological qualification which this council intends to give to the doctrine discussed — we do not hesitate, with the help of God, to promulgate the present constitution On the Nature of the Church. It would seem to us that the best commentary is that through this promulgation nothing in traditional doctrine is really changed. What Christ wants, we also want. That which was remains. What the Church has taught for centuries, we likewise teach. The only difference is that what was simply lived previously is now declared expressly; what was uncertain has been clarified; what was meditated on, discussed and in part disagreed with now reaches a serene formulation. Truly we can say that Divine Providence has prepared a shining hour for us; yesterday slowly maturing, today resplendent, tomorrow surely rich in teachings, to stimulate and improve the life of the Church. We also say we are happy this constitution renders honor also to the People of God. Nothing can give us greater pleasure than to see proclaimed the dignity of all our brothers and sons who make up the Holy People of God, to whose vocation, to whose sanctification, to whose salvation and guidance the hierarchical ministry is oriented. How happy we are also to see the constitution proclaim the dignity of our brothers in the episcopate, honor their role in the Church and recognize their powers. We cannot thank God sufficiently for having granted us the privilege of honoring the sacred character of your ministry and the fullness of your priesthood, beloved and venerated brothers, to acknowledge the loyalty that binds you to each other and to us. We have observed with edification how the principal, unique and universal mission entrusted to Peter by Christ and transmitted to his successors, the Roman Pontiffs, whose authority we today hold, unworthy as we are, is fully and repeatedly recognized and venerated in this solemn document which we have just promulgated. We cannot fail to be pleased by this, not for the prestige deriving from it to our person, since we are fearful rather than eager for such a mission, but for the honor rendered to the word of Christ, for the consistency manifested with the teaching and the tradition of the Church, for the guarantee assured for the unity of the Church itself and the harmonious and secure effectiveness assured to her government. It was of highest importance that this recognition of the prerogatives of the office of the sovereign pontiff should be stated explicitly at this time when the question of episcopal authority in the Church was to be dealt with in order that this authority would not be in contrast with the power of the pope but should stand out in full harmony with the vicar of Christ as head of the apostolic college. And it is this intimate and essential relation that makes a unified assembly of the episcopate, that finds in the successor of Peter, not different and extraneous, but rather its center and head. This in turn makes us anxious to laud your prerogatives with ours, to rejoice in their exaltation, to vindicate their excellence, so as to integrate them with our own. Thus acknowledging the episcopal mission in its fullness, we feel the communion of faith, of charity, of co-responsibility, of collaboration increasing around us. We do not fear that our authority will be lessened nor hampered while we acknowledge and extol yours; but rather we feel stronger because of the tie that draws us together; we feel more able to guide the universal Church with the knowledge that each of you is working toward the same end; we feel more trustful in the help of Christ because we are and want to be all gathered together more closely in His name. It is not easy to say what practical consequences these doctrinal clarifications may have, but it is not difficult to foresee that they will be fruitful in spiritual insights and canonical ordinances. The ecumenical council will have its definite conclusion with the fourth session. But the application of its decrees will involve a network of post-conciliar commissions in which the collaboration of the bishops will be indispensable; as likewise the occurrence of questions of general interest to the modern world will make us even more disposed than we now are, venerable brothers, to call some of you, designated, at the proper time, together and consult you at determined times, in order to have around us the comfort of your presence, the help of your experience, the support of your counsel, the assistance of your authority. This will be useful also because the reorganization of the Roman Curia, which is now undergoing careful study, will be able to profit from the experienced help of diocesan bishops, thus integrating its organization, already so efficient in faithful service, with bishops from various countries bringing the help of their wisdom and charity. This plurality of studies and discussions may entail some practical difficulties. Collective action is more complicated than individual action, but if it better serves the monarchical and hierarchical character of the Church, and comforts our labor with your cooperation, we shall be able to overcome with prudence and charity the obstacles inherent in a more complex organization of ecclesiastical government. We like to think that the doctrine of the mystery of the Church, illustrated and proclaimed by this council will, from this moment, find a positive echo in the minds of Catholics. Especially it will let the faithful see the real face of the bride of Christ more fully delineated and revealed; it will let them see the beauty of their mother and teacher; the simplicity and the majesty of the lines of such a venerable institution; it will let them admire a prodigy of historical fidelity, of stupendous sociology, of outstanding legislation, a forward-moving realm in which divine and human elements blend in order to reflect on believing humanity the outlines of the Incarnation and the Redemption — the whole Christ Our Savior, to use the expression of St. Augustine. May this spectacle bring intoxicating joy especially to those whose only and constant profession is the search of Christian perfection. We mean the Religious, who are the exemplary members of the Church, its generous supporters, its dearest sons. And may joy and consolation come also to those our brothers and sons who live in places where sufficient and dignified religious liberty is still denied to them or is so restricted that we have to number them in ranks of the Church of silence and tears. Let them rejoice in the doctrinal splendor that illuminates Holy Church, to which their suffering and fidelity offers stupendous witness, thereby deserving for themselves the greater glory — that of Christ, victim for the salvation of the world. We also hope that the same doctrine of the Church will be benevolently and favorably considered by the Christian brothers who are still separate from us. We wish that this doctrine, completed by the declarations contained in the schema On Ecumenism, likewise approved by this council, might have in their souls the power of a loving leaven for the revision of thoughts and attitudes which may draw them closer to our communion, and finally, God willing, may merge them in it. To us this same doctrine gives the surprising joy of observing how the Church, by precisely tracing its own outlines, does not restrict, but widens the boundaries of its charity and does not check the movement of its multiform progress, inviting catholicity. May we be allowed at this point to express, on this occasion also, our reverent greeting to the observers who are here representing Christian Churches or confessions separate from us, our thanks for their welcome assistance at the conciliar meetings, and our warmest wishes for their Christian prosperity. And finally we should like the doctrine of the Church to radiate some attractive light on the profane world in which it lives and by which it is surrounded. It must appear like a sign raised among the peoples (Is. 5,26) to offer orientation to all on their way toward truth and life. In fact as anyone can see, while the elaboration of this doctrine observes the theological rigor that justifies and magnifies it, it never forgets mankind which assembles in the Church and which constitutes the historical and social environment in which its mission is exercised. The Church is for the world. The Church does not desire any other earthly power for itself than that which enables it to serve and to love. By perfecting its thought and its structure, the Church does not aim at estranging itself from the experience which is proper to the men of its time, but it aims rather at understanding them better, at sharing better in their sufferings and their good aspirations, at better sustaining the effort of modern man toward his prosperity, his liberty, his peace. But this recurrent theme will have its development at the end of the council when the schema on religious liberty, which will crown the work of the council, and which, only because of lack of time at the end of this session, could not be ended, and the one on relations between the Church and the world, which has already been deliberated on at the present session, will be finally and completely treated at the next session. And now, in conclusion, another thought strikes us. Our thought, venerable brothers cannot but rise with sentiments of sincere and filial gratitude to the Holy Virgin. Also, to her whom we like to regard as the protectress of the present council, the witness of our toil, our most kindly adviser, because it is to her, as a heavenly patron, together with St. Joseph, that the work of our ecumenical assembly was entrusted by Pope John XXIII right from the start. Moved by these same sentiments, last year we offered to the Most Blessed Mary a solemn act of common homage, by gathering in the Liberian basilica, round the image venerated with the glorious title of “Salus Populi Romani” (“Salvation of the Roman people”). This year, the homage of our council appears much more precious and significant. By the promulgation of today’s constitution, which has as its crown and summit a whole chapter dedicated to Our Lady, we can rightly affirm that the present session ends as an incomparable hymn of praise in honor of Mary. It is the first time, in fact — and saying it fills our souls with profound emotion — that an ecumenical council presents such a vast synthesis of the Catholic doctrine regarding the place which the Blessed Mary occupies in the mystery of Christ and of the Church. This corresponds to the aim which this council set itself of manifesting the countenance of the Holy Church, to which Mary is closely linked, and of which, as it has been authoritatively affirmed, she is portio maxima, portio optima, portio praecipua, portio electissima (greatest, finest, principal, most elect part) (Rupert, in Ape. I, VII, c 12, P.L. 169,10434). Truly, the reality of the Church is not exhausted in its hierarchical structure, in its liturgy, in its sacraments, in its juridical ordinances. The intimate, the primary source of its sanctifying effectiveness are to be sought in its mystic union with Christ; a union which we cannot conceive as separate from her who is the Mother of the Word Incarnate and whom Jesus Christ Himself wanted closely united to Himself for our salvation. Thus the loving contemplation of the marvels worked by God in His Holy Mother must find its proper perspective in the vision of the Church. And knowledge of the true Catholic doctrine on Mary will always be a key to the exact understanding of the mystery of Christ and of the Church. Meditation on these close relationships between Mary and the Church, so clearly established in today’s conciliar Constitution, makes us feel that this is the most solemn and appropriate moment to fulfill a wish which, after we mentioned it at the end of the preceding session, very many council Fathers made their own, pressing for an explicit declaration at this council of the Motherly role of the Virgin among the Christian people. To achieve this aim, we have felt it opportune to consecrate in this very public session, a title which was suggested in honor of the Virgin from various parts of the Catholic world and which is particularly dear to us because it sums up in an admirable synthesis the privileged position recognized by the council for the Virgin in the Holy Church. Therefore, for the glory of the Virgin Mary and for our own consolation, we proclaim the Most Blessed Mary Mother of the Church, that is to say of all the people of God, of the faithful as well as of the pastors, who call her the most loving Mother. And we wish that the Mother of God should be still more honored and invoked by the entire Christian people by this most sweet title. This is a title, venerable brothers, not new to Christian piety; it is precisely by this title, in preference to all others, that the faithful and the Church address Mary. It truly is part of the genuine substance of devotion to Mary, finding its justification in the very dignity of the Mother of the word Incarnate. Just as, in fact, the divine maternity is the basis for her special relationship with Christ, and for her presence in the economy of salvation brought about by Jesus Christ, thus it also constitutes the principal basis for the relations between Mary and the Church, since she is the mother of Him who, right from the time of His Incarnation in her virginal bosom, joined to Himself as head His Mystical Body which is the Church. Mary, then as mother of Christ, is mother also of all the faithful and of all the pastors. It is therefore with a soul full of trust and filial love that we raise our glance to her, despite our unworthiness and weakness. She, who has given us in Jesus the fountainhead of grace, will not fail to succor the Church, now flourishing through the abundance of the gifts of the Holy Ghost and setting herself with new zeal to the fulfillment of its mission of salvation. As for ourselves, just as at the invitation of Pope John XXIII we entered the council hall, along with “Mary, the Mother of Jesus,” so at the close of the third session we leave this temple with the most holy and sweet name of Mary, Mother of the Church. As a sign of gratitude for her loving assistance, lavished on us during this last conciliar period, let each of you, venerable brothers, pledge himself to hold high among the Christian people the name and the honor of Mary, indicating in her the model of faith and of the full response to any call from God, the model of the full assimilation of the teaching of Christ and of His charity, so that all the faithful, united in the name of the common Mother, may feel themselves ever more firmly rooted in the faith and in union with Jesus Christ, and at the same time fervent in charity toward the brothers, promoting love for the poor, dedication to justice and defense of peace. As the great St. Ambrose exhorted: “sit in singulis Mariae anima ut magnificet Dominum; sit in singulis spiritus Mariae et exultet in Deo” (“Let the soul of Mary be in individuals, that it may magnify the Lord; let the spirit of Mary be in individuals, that it may rejoice in the Lord”) (St. Ambrose, Exp. in Luc. II, 26, 15, 1642). Above all, we desire that it should be made clear that Mary, the humble handmaid of the Lord, exists only in relation to God and to Christ, our sole Mediator and Redeemer. And likewise, may the true nature and the aims of the Marian veneration in the Church be illustrated, particularly where there are many separated brothers, so that those who are not part of the Catholic community may understand that devotion to Mary, far from being an end in itself, is instead a means essentially ordained to orient souls to Christ and thus unite them with the Father in the love of the Holy Ghost. While we turn in ardent prayer to the Virgin, that she may bless the ecumenical council and the entire Church, hastening the hour of the union of all Christians, our glance opens on the endless horizons of the whole world, the object of the most lively care of the ecumenical council, and which our venerated predecessor, Pius XII of venerated memory, not without inspiration from on high, solemnly consecrated to the Immaculate Heart of Mary. Today, we consider it particularly opportune to recall this act of consecration. Bearing this in mind, we have decided to send a special mission to Fatima in the near future in order to carry the Golden Rose to the sanctuary of Fatima, more dear than ever not only to the people of the noble Portuguese nation — always, but particularly today, dear to us — but also known and venerated by the faithful throughout the entire Catholic world. In this manner we intend to entrust to the care of this heavenly Mother the entire human family, with its problems and anxieties, with its legitimate aspirations and ardent hopes. You, auxilium Episcoporum, aid of bishops, protect and assist the bishops in their apostolic mission, and all those priests, Religious and laymen, who help them in their arduous work. You who were presented by your Son Himself, at the moment of His redeeming death, as Mother to His best-loved disciple, remember the Christian people who entrust themselves to you. Remember all your sons; support their prayers to God, preserve their faith, strengthen their hope, increase their charity. Remember those who are in tribulation, in need, in danger and particularly those who suffer persecution and who are in prison because of their faith. For these, O Virgin, obtain fortitude and hasten the desired day of just freedom. Look with benign eyes on our separate brothers and condescend to unite us, you who brought forth Christ as a bridge of unity between God and men. O, temple of light without shadow and without blemish, intercede with your only Son, mediator of our reconciliation with the Father (cf. Rom. 5, 11) that He may have mercy on our shortcomings and may dispel any difference between us, giving us the joy of loving. To your Immaculate Heart, O Mary, we finally recommend the entire human race. Lead it to the knowledge of the sole and true Savior, Jesus Christ; protect it from the scourges provoked by sin, give to the entire world peace in truth, in justice, in liberty and in love. And let the entire Church, by celebrating this great ecumenical assembly, raise to the God of mercy the majestic hymn of praise and thanksgiving, the hymn of joy and of exultation, because the Lord has worked great things through you, O clement, O pious, O sweet Virgin Mary.